Big news of the day is that Ancestry.com is pondering a sale of their website. Hell, if I had the money, I’d put in a bid! Better yet – why don’t subscribers pool their funds to buy it? Owner benefits would include a free lifetime World Explorer Plus membership! Going in another direction, what if the LDS folks snatched it up? Combining Ancestry.com with FamilySearch.org would be HUGE. Sure, there’s much overlap; but each offer their own great collections of exclusive information. And both have already been partnering with other major genealogical websites! I would have NO problem with paying for a subscription to AncestryFamilySearch.com. That “extra” money would go towards the acceleration of LDS’s digitizing microfilm for online databases; a massive undertaking. How incredible would THAT be?? Yes, many would yell “Monopoly!”, but don’t these two websites, the TOP TWO of 2015 (and located less than an hour’s drive of each other! ), combine to be a sort of monopoly anyway? And what would be wrong with that?? Logo courtesy of Ancestry.com and FamilySearch.org and Photoshop and John B. Finding the majority of your sources on AFS.com would surely make online research just that much easier. Yes, it’s always nice to imagine the possibilities. Nice interview with Henry Louis Gates, Jr. in the Fall 2014 edition of NEHGS’ American Ancestors magazine. The great news is that PBS, Ancestry (main sponsor), New England Historical Genealogical Society (main researchers) have agreed to do another three seasons of his Finding Your Roots! They’ve already got dozens of guests chosen and confirmed. While I have a few issues with the show (research “shortcuts”, effect on professional clients’ expectations), I find it extremely interesting and well done. I’ve learned a lot, a good chunk to do with DNA. We’re even much more mixed up than I originally thought! Actually, genealogy and computer programming are similar in many ways. The debugging of programs highly resembles attacking a genealogical brick wall. Mr. Gates also said that NONE of his guests regretted discovering their ancestry OR were sorry they were on the show. He was being very modest here, as I’m sure MOST of the guests have been affected quite profoundly by their experience. Said Gates, “It’s been very rewarding. It makes me feel like Santa Claus, like I’m making it Christmas every day for the people lucky enough to be chosen as guests…”. Researchers also feel that way upon finding a long-hidden genealogical gem. When we DON’T, it’s time to hang up the RootsMagic and try crocheting or stamp collecting. Yep, just like unwrapping a present from “Skip”; as he is often referred to in the interview by NEHGS President Brenton Simons. They even did it where some of the show takes place – in NEGHS’ Treat Rotunda, which I’ve yet to visit. Because I’m usually running right to their manuscripts, microfilm or books! I’m sure the main rush of being on the show is getting that ancestral information – all at once! As researchers, we tend to unwrap a number of small presents over a period of time, while Mr. Gates’ guests open up a giant one during the one-hour show! Anyway, props to “Finding Your Roots” and the informative American Ancestors article. Henry Louis Gates, Jr. seems like a guy you could just hang out with, chatting for hours about genealogy. And I’m still working on the concept of an Instant Connections game show, mentioned in my last post. It’ll be a combo of Love Connection, Joker’s Wild, Name That Tune and instant oatmeal. Uh, for the instant part. No takers yet, but give it time. I’ve got 11 years! Well, if I can’t create game shows, I CAN research your family history, as I am… The Online Genealogist!! What’s going on in the genealogy world today? As I said in my post, I fully understand that information costs money. My gripe was with the yearly membership costs grand total I need to pay for those several websites and societies I’m a member of. It adds up quickly! And not a moment too soon, it’s a new “free” website we’ll end up paying for anyway (via taxes) – MyHeritage Library Edition! Great news for the “I only use FREE genealogy websites!” crowd. Trove is a great starting point for your Australian research. Not just newspapers; they have books, maps, photos, videos and archives websites. Very much like an Aussie Internet Archive…and also FREE. And, no – I will not be trying a Vegemite sandwich any time soon. I’m sure we’ll be seeing an increase of similar stories as genealogy gets a boost from shows like Who Do You Think You Are? and Genealogy Roadshow. Happy Family History Month to everyone! For The Online Genealogist, every month is Family History Month; hire me and I’ll prove it to you! Find A Grave (via Ancestry.com’s blog) announced that the 100,000,000th photo was uploaded onto their website. Yeah, I could’ve written it as “100 Million”, but look at all those ZEROES! That’s a great milestone and pretty impressive for a website that many originally blew off as a celebrity-worship “ooooo, this is where he’s buried!” novelty destination that would be gone in a few years. But after 19? Boy, did they prove ME – errr, THEM wrong!! Find A Grave is a definite boon for genealogists, historians and the entire goth community! Me eating crow. Poorly. And has THIS finally been successfully proven? 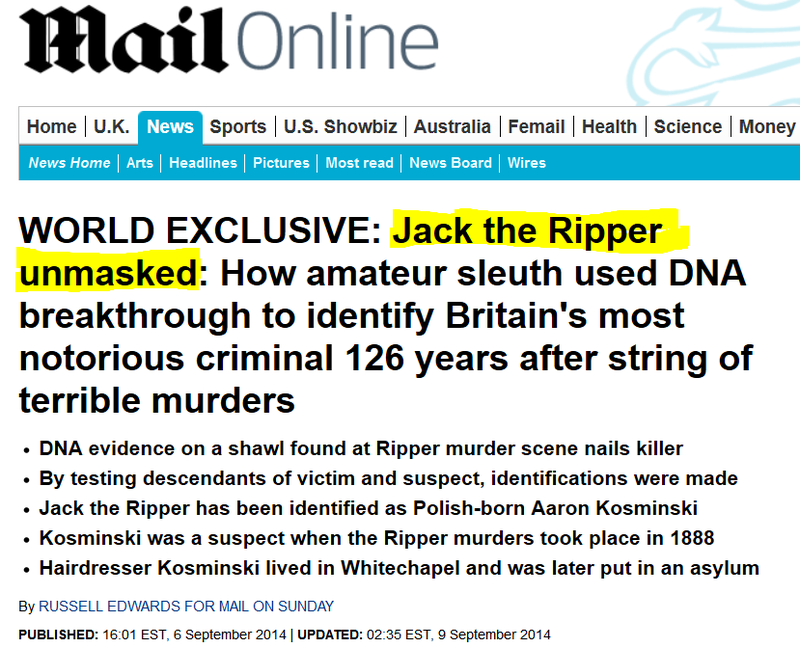 Mr. Edwards claims he was able to extract DNA from a shawl found by one of Jack’s victims. How?? Ya gotta buy his BOOK to find out!! Eh, in all fairness, the article is rather meaty and has several photos, so I will not mock. Thank you, Mr. Edwards! The free plug for his BOOK should make up for any ill will. Fascinating stuff, for sure! And NOT to sound like a broken record regarding online records, but here’s MORE!! Scroll down a bit for the numbers. FamilySearch.com is surely living up to their promise of a continuous flow of digitized records – indexed and non-indexed! So, instead of waiting for the entire indexing process to catch up to the records (a few years?? ), they keep adding all sorts of goodies for us to BROWSE through. Did I ever mention I love to browse? Well, even with all the indexes, I often end up browsing anyway. Whether it be to find the actual ancestor I’m looking for or learn more of what and who’s around that ancestor if some promising results came up in the initial search. These two FamilySearch items are of special note to U.S. researchers, as they are NEW sources; the others were updates to existing collections. I’ll close out with something I came across today, from nearly 100 years ago, it’s the 1915 Norwich, Connecticut Tax List via the Norwich Bulletin! This is a great mid-decade resource for placing your Norwich, CT ancestor. Check it out. You could actually find someone you “know” in there! But if your ancestors never lived in Norwich (99.9999% of us), I can still help you out! 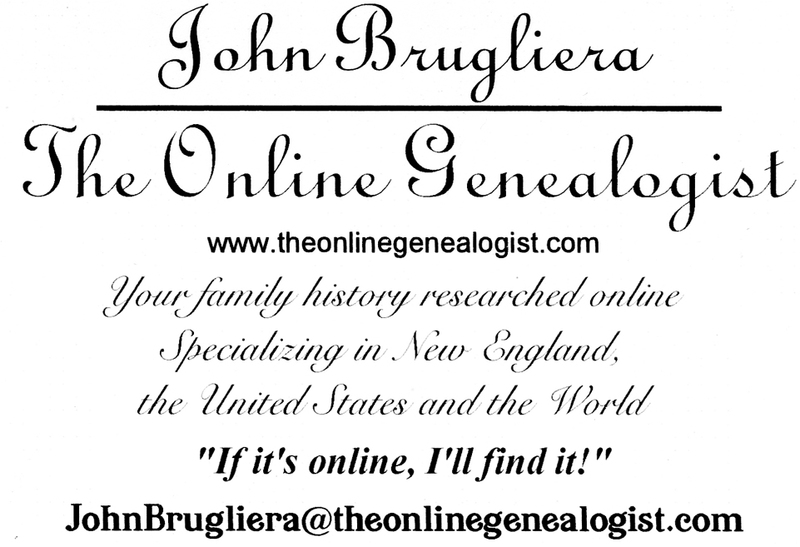 Hire ME — The Online Genealogist!!! Nothin’ like a few million FREE IMAGES to spice up your family story! The Internet Archive folks recently posted over 2.5 million IMAGES onto the photo-sharing website, Flickr. Extracted from thousands of books originally searchable by text ONLY at Internet Archive. Now the images can be searched on Flickr! Why is this a big deal for genealogists? We get perty pictures to go with our family histories! Even though they are mostly “old” images past copyright, you’ll surely discover a visual gem or two to accompany your ancestors’ stories. Whether it be something specific like a photo of a long-gone family homestead or generic such as a period steam liner used to illustrate an immigrant family’s trans-Atlantic journey – it’s probably in there. Remember, we’re talking over two-and-a-half million images here! Or perhaps some of your family lived near Chicago’s Garfield Park. Here’s a close-up of that area from 1921. There are several other neighborhoods available for viewing/downloading! Maybe you’re the 3rd-great-grandchild of Dr. P. Edward Seguin, who set up practice in Royalton, Minnesota. Do a Flickr search for him now and his photo comes right up! He’s the one with the facial hair (heh). Then you hit a link and the original book is shown in its entirety; you’ll see the image in context and maybe find a few more words to go with your Man of 10,000 Lakes. And while most early records aren’t OCR-friendly, they are definitely considered to be images. Such as the below Allen County, Indiana Circuit Court Index from 1824. (Hi ACPL!) All images are downloadable, with Flickr’s excellent choices ranging from thumbnail to original. I always grab the original, then re-size that as needed. You can also download several stock photo-type items without the worry of being busted by the copyright police! Like this large uppercase “C” for your the background of your Carlson Family homepage. Anyway, you get the idea. That is to NOT overlook this incredible Flickr/Internet Archive e-collection while gathering all sorts of images for your family story. Then there’s this one image we will ALL use when we finish our family histories and they’re complete. Oh, and PhotoShop, etc. can also straighten images to make them even PERTIER! And if YOU think that your ancestry can be traced all the way back to Adam & Eve, do NOT hire me — the Online Genealogist!! Who Do You Think You Are? Inside scoop!!! Wasn’t that Bo Donaldson & the Heywoods’ second-highest-charting single, which reached #15 on Billboard Magazine’s US Top Pop 100 chart in the summer of 1974? It was a follow-up to their #1 Billy Don’t Be A Hero that spring. THAT Who Do You Think You Are?? Then that’s it. That’s all I know about it. But I see on their website, which shall remain nameless, the first three full episodes of the season. So I watched. All three. Not at once. Consecutively. Wow. Unfortunately, the “easily hopping from one set of original records to the next” isn’t a reality for most of us. Yeah, we HOPE to get there “one day”, but by the time we’ve climbed up several generations, that’s dozens of locations spanning either the country, or most likely, the globe. Anyway, that’s what struck me the most after watching the shows. And that some genealogy newbie will assume it’s “that simple” and quickly done, when it usually isn’t. Which, to me, is the best part of genealogy! And now you’re left going “What the %@! !# is he talkin‘ about?”, as I seemed to have gotten off track there somewhat. Though, I’m sure you’ve all had at least one of those moments. This makes too much sense. Even in my area cemeteries, there’s always someone walking, jogging, biking through. But way too small to be charging admission! I can see the slogans now… “It’s a gentle, peaceful walk”… “Celebrate life amongst the dead”… “This ain’t your mother’s Scooby-Doo graveyard!”… OK, so they need some work. Going from buried people to buried records. Staying in New York City, but visiting Massachusetts. It’s amazing what is still collecting dust in church attics and rectory cellars. And how many churches can YOU think of that have gone up in flames over the years? More fingers than I got! Churches and fire are kind of like trailer parks and tornadoes. And, yes – a courthouse made of bricks CAN burn. So sad. And just after you’ve gotten used to FamilySearch‘s indexing program during their recent key-athon; they’re going to “improve” it and gives us “more features”. Bring on the next key-athon, I say! !